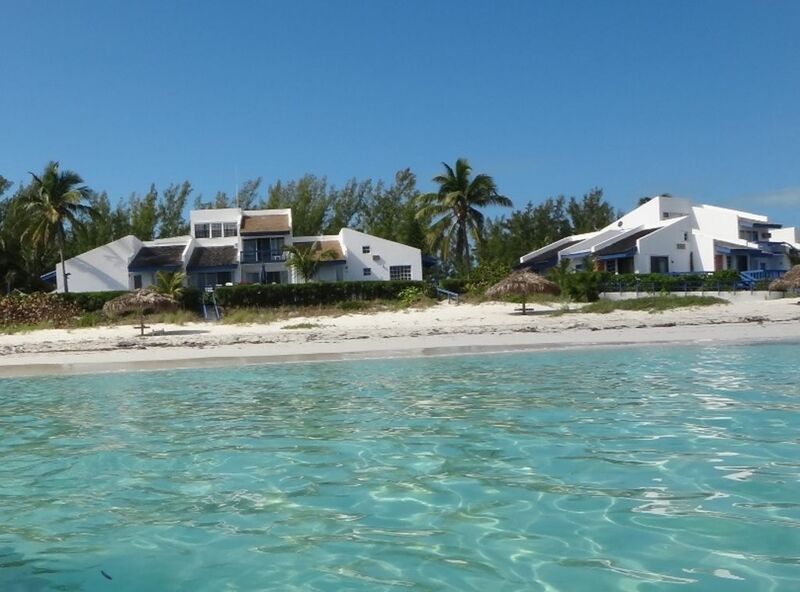 Whether your ideal vacation consists of action packed days of watersports, relaxing on the beach, or taking a nap on a hammock under a palm tree, our beach front villa on Great Harbour Cay is the perfect destination. Our double sized villa is steps away from the beach with unobstructed ocean views, and consists of a separate bedroom with two full beds, a loft with a queen size bed, a twin day bed, full kitchen, washer/dryer, and two full baths, accommodating up to 7 people. A pack and play can also be provided for the little ones. The villa is equipped with a phone and wifi if you feel the need to remain connected to the rest of the world. We are also pet friendly. The layout is bright and airy, with a modern spa-like interior design by a renowned San Francisco designer. 1. How do I get to your island? There is an airport on Great Harbour Cay, and is usually accessed either from Nassau or Florida. If you fly into Nassau (NAS) there are two regularly scheduled flights each day on Le Air at 7:50am and 4:30pm from Nassau to Great Harbour Cay, returning from Great Harbour to Nassau at 8:20am and 5:00pm, and the flight is about 17 minutes. The flights are reliable and cost $140- $160 per person round trip. Alternatively Le Air offers charters on their smaller plane that carries up to 5 passengers, and they charge $510 each way for up to 5 people. The advantage of their charter is that you can pick the times yourself. The other option is to fly from Opa Locka Airport, which is about half way between Miami Airport and Ft. Lauderdale Airport to get a direct charter flight to Great Harbour. We have flown for over 15 years with Markus of Air Charter Miami and they are very safe and reliable. The flight is 45-50 min and carries up to 8 passengers. We are happy to help coordinate flights for you. 2. Is there shopping on Great Harbour Cay? There are two grocery stores and a couple of liquor stores on the island. There are plenty of non perishables for sale on the island like drinks, bread, pasta, cereal, as well as milk, butter, etc. However we recommend that our renters purchase their fresh fruits and veggies as well as steak, chicken, and cold cuts either in Nassau or Florida (depending on where you fly from) and bring them with you on the plane. If you have at least a 3 hour layover in Nassau, we know a driver who can pick you up at the airport, take you grocery shopping, and then bring you back to the airport in time for your onward flight to Great Harbour. There is also a great new shopping service in Nassau where you can order your groceries ahead of time on line, and they will be delivered via the daily flights from Nassau on LeAir. You can even order before your trip and we will pick them up and have your kitchen stocked for you with the groceries that you order! 3. Are there restaurants on the island? Beach Club: about a 5 minute walk down the beach from our villa. They serve breakfast and lunch everyday and then sometimes on Fri and Sat they serve dinner too. Best cheeseburgers ever. Coolie Mae's: Cute restaurant in town on a hill with great sunset views. Really good fish and conch. Pool Bar: Open Air restaurant in the Marina. Great atmosphere with BBQ grilled steaks, chicken, and seafood. Carrie Earl: A British couple runs the restaurant here and it is a really good mix of European and Bahamian food, with a great bar. There is also a fun BBQ at the Marina every Friday night, as well as a themed dinner (Italian, Cuban, Creole, etc.) every Saturday night at the Tamboo restaurant next to the Marina. There are several other small restaurants as well. 4. Do you have a coffee maker? Yes! We have a French Press (kindly donated by a previous renter) as well as a Tassimo single cup coffee maker that uses "t-pods". We have dozens of pods there for you that come in about 6-8 different flavors. 5. Do we need a car? We do have bikes available for your use, but you will find a car convenient if you do decide to venture away from the villas. Most things are within 2-3 miles, but in the sun and with a few hills this can get far by bike. We can arrange a rental of a car or golf cart for you. 6. How do I get to your property? Our property manager Wally, who is somewhat of a celebrity on the island and is immediately loved by our guests, will pick you up at the airport and bring you to our property (less than 5 minute drive). He will also get you oriented as to where the shops and restaurants are located, and provide any local knowledge you desire. He also makes an amazing coconut milk drink! Four generations of our family have enjoyed the wonders of Great Harbour Cay, and we are the original owners of this property. This truly is our family home, and we are happy to be able to share it with those looking to experience the magic of the island. in 1969 our family first visited Great Harbour Cay, and before the afternoon was out they fell in love with the Island and purchased our townhouse on the marina - even though it was still under construction at the time! A few years later when the beach villas were built, we knew we had to have one. Our villa is in the best location - it is directly facing the beach with a huge wrap around deck. The deck has a hammock under your personal palm tree, as well as comfy lounge chairs and outdoor table seating for 6. It is about 10 steps from your deck to the sand! This is our family getaway, so it has all of the comforts of home- full kitchen, washer/dryer, wifi, telephone, and luxurious towels and linens. The beaches on the island are among the most beautiful in the world, and you will never meet friendlier people than those from Great Harbour Cay. The Villa is directly on the beach with a wrap around deck facing the ocean. Take 10 steps and your feet are in the sand! Brand new machine. Detergent is included. 27' center console boat with guide available for rent, as well as flats boats. Adult and child life vests available. We stayed almost two weeks at this wonderful stay. Everything was sumper comfortable and clean. If we ever come back, we will definitely stay again at your house, Darin. Great island. Location was perfect. Accommodations were simple, but comfortable. Perfectly situated on a stunning beach. Short walk to the Beach Club for breakfast and lunch. Used the bikes that were available to us and explored the whole island. So fun! Wally and Catherine took care of us and transported us to and from the airport. Great vibe! We had the best time! The villa had a wonderful view of the beautiful blue water. Wally picked us up front the airport and gave us a tour of the island and took us to the store. The beds were comfy. It had everything we needed. The location was excellent it’s within 5 minutes of the airport and walking distance to the beach club. Me. Ramsey Rellys car rental was right across the street. We loved the island. The people are so kind and friendly. We will definitely be back. We really enjoyed the condo and the beach location. The condo and the surrounding property was well kept. Beautiful water, incredible white sand beach and great accommodations ! We are already planning a return trip. The owner Darin was helpful with pre-trip information and Wally the resident care taker on the island was there to meet us when we arrived and he helped get us to the condo and was very helpful during the week with information on things to do and also if we needed anything at all. Wally’s nickname on the island is “Sunny day “ because he is always smiling and always positive ! If you want night clubs, swimming pools, and crowded beaches Great Harbour cay is not for you. If you want a slice of real island life with incredible beaches and almost no one else around this is the place!! Our beautiful double beach front villa is located on one of the most beautiful beaches in the world- powder soft sand, unreal shades of blue waters, and miles of beach to yourself. You can walk five minutes down the beach to the charming beach club for lunch or breakfast, explore the island on one of the four bikes and two kayaks that we provide, call a taxi, or rent your own car. We also have a 27' boat with guide available for rent for fishing, snorkeling, spearfishing, kiteboarding, or just island hopping and exploring. Food shopping and restaurants are within a 5 minute drive from the Villa. It is actually fairly convenient getting to Great Harbour Cay. If you fly into Nassau (NAS) there are two regularly scheduled flights each day on Le Air at 7:50am and 4:30pm, returning from Great Harbour to Nassau at 8:20am and 5:00pm, and the flight is under 20 minutes. The flights are reliable and cost $140- $160 per person round trip. You can also charter flights out of Opa Locka Airport, which is about half way between Miami Airport and Ft. Lauderdale Airport- a taxi ride of 10-20 min. We have flown for over 15 years with Markus of Air Charter Miami and they are very safe and reliable. The flight is 45-50 min and the charter carries up to 8 passengers. You can reach them at (305) 333-9263.